​​This guide is designed help both parents and student who are in rolled in beginning band understand the rules, procedures, and expectations of the band program. Please read through this information carefully. You are always welcome to ask questions once you have reviewed all the material. Our band department uses Meyer Music to help serve our students. The Meyer Music Company works hard to offer products at a fair price and to deliver them to our schools as quickly as possible. When you order, you will need to tell them the school district (Ray-Pec) and the school (Eagle Glen) and your child's name so we can get the supplies to your child as quickly as possible. I strongly recommend having Meyer Music deliver the items directly to school. If you do this, shipping is free, and it arrives much faster. Occasionally instruments require some repair. This is normal. Here are the steps to follow if your child's instrument requires repair. Too many times I’ve seen simple repairs turn into big repairs because someone in the family tries to fix it themselves. Please do not put your child's instrument at risk of further damage. Many times Mr. Houston can fix common instrument problems. I have several instrument tools that are not the same as tools you may have at home. If I cannot fix it, I will let you know. If Mr. Houston cannot complete the repair, I will recommend the instrument be sent to a repair shop. Many of you already have this covered through your rental agreement with Meyer Music. Your repairs may be completed at NO COST. If you did not select the repair plan or your instrument is not from Meyer Music, we can still send your child's instrument to Meyer Music. Complete the Instrument Repair Form and send it to school with your child's instrument. ​Before an instrument is sent in, your child should remove their mouthpiece and music so they can continue bringing them to class. This will allow students to continue participating in class while the repair is being repaired. Line up in the hallway quietly and wait patiently until invited into the room. Enter the room in line order and quickly bring a music stand & chair to your assigned location. Place chromebooks, and any other items under your chair. Once your chair & music stand is in your assigned location, quietly get your instrument from the shelf. Quietly return to your seat and assemble your instrument. Place your cases on the right side of your chair. Begin silently air practicing your assigned music. Watch for Mr. Houston for further instruction. Swab or drain your instrument and carefully put it in your case. Bring your case to your assigned spot on the shelf. Stack your chair and music stand in their assigned location (Where you found it at the beginning of the classroom). Line up a long the cabinets by the door and wait to be dismissed by the teacher. At the end of the day, return to the band room to get your instrument and music. TAKE YOUR INSTRUMENT HOME WITH YOU EACH DAY. Enter the room in line order and quickly bring a music stand to your assigned location. If you play the keyboards that day, roll the instrument with your partner. If you play snare drum that day, bring a second music stand to you spot. Place chromebooks, and any other items in your assigned square. Quietly return to your seat and begin silently air practicing your assigned music. Put the cover back on your instrument if you were play the keyboards. Bring the keyboard to its assigned location and put your personal equipment in your assigned square. You need your instrument in band each day. Play your instrument during band class and at home. Do not play at other locations (such as on the school bus or at recess). A musical instrument is not a toy. Do not allow younger children to play around on it. Feel free to play something for them. The more you do something the better you get. This is why we practice. If you are running low on supplies (reeds, valve oil, etc. ), tell your parent before​ you run out. Students will demonstrate musical skill through performance and literacy. I can practice positive participation in daily rehearsals and concerts. Students will have quizzes where they play their instrument for Mr. Houston. Students will track their progress in class, and for some assignments they will receive a sticky note (like the own shown) to put in their book. The sticky note shows their score for each learning target (except #5) and areas to improve. In the beginning, only one or two learning targets will be graded at a time. Later in the year, students will be assessed on all learning targets for each item they play. In band, all five areas are important to make a great performance. You won’t see many grades in the beginning for band. The students need the opportunity to develop fundamental techniques and strength before beginning assessments. During this time period, students are receiving a lot of feedback in class to help them know exactly how to improve. Starting out, it is common to see scores of 1's and 2's. A score of 1 indicates either we are just introducing a skill and the student requires additional time to become proficient. A score of 2 indicates the students is on the right track and is progressing appropriately. Later in the process most students will begin earning a score of 3 in certain areas. This indicates they have become proficient at the specific skill being performed. A score of 4 is less common as it indicates performing beyond grade level expectations for a specific skill. Notice that this example student started at a "1" for the first three assessments and then remained at a "2" for six and a half months. This indicates that the students continues to be on the right track for that period of time. Please understand that the students is NOT remaining stagnant with their skill level. They are continuing to progress as expected. Band uses long term learning targets, meaning that even in August we are grading compared the end goal of the student's skill level in May. If the students continues to receive "2's" on their assessments, this means they are on track to become proficient (earn a 3) by the end of the year. To Grade, or Not to Grade? Students will be assigned quizzes and playing assignments throughout the school year. Students will receive feedback for all assignments (either verbal or written, such as the sticky note above). However, not all assignments will be entered into the official grade book. I want students to have an adequate amount of time to practice skills without a penalty while receiving feedback to support their learning. I strive to enter two official grades per month like the example grades shown above. This is my goal, but may not always be possible due to schedule changes, preparing for concert music, and most of all, the current needs of students. ​Proper practice allows students to keep up with the fast-paced learning that takes place in band. Below is example of different practice times through the week. As you can see, it is possible to adjust you practice time schedule to work around the other events in your life. *Week 2 is the ideal practice scenario. It is better to spread shorter practice times over several days than it is to practice fewer days for longer times. Week 1 scenario is a close second place and is also an ideal practice scenario. Week 3 is okay, but less effective than Week 2 or 1. Students will submit practice logs and assignments through Essential Elements Interactive (EEI). EEI is an online practice solution that coordinates with each student's band book. Students and parents can both create accounts within EEi. Student accounts can enter practice logs, submit assignments, and practice with recordings that accompany the lines in the band book. Click the Students or Parents icon. 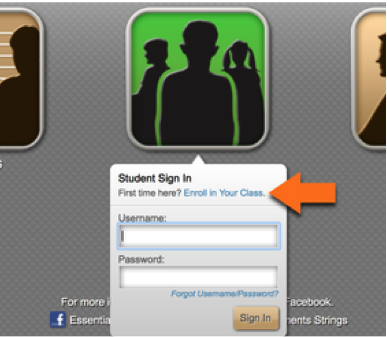 Select the Enroll In Your Class link. Enter your student's code (provided by Mr. Houston). You will create your own username and password. An email address may already be entered for you. You may update it at any time. EEI requests your phone number and cell carrier to allow text message communication. You do not need to enter this information as I do not use this feature in EEI. What if we don't have internet access at home? If a student does not have access to the internet at home, they will enter their practice log minutes and assignments from school. All students have a school Chromebook issued to them to use at school and home. ​To assist with practicing, students will be able to access recordings of the assigned lines by going to www.myeelibrary.com. The student will log in using the code from their band book. They can download the recordings onto their Chromebook at school and then use the recordings to practice at home without a need for an internet connection. Students are required to bring their instrument, mouthpiece, and music/supplies to school on each day. Although many classes at Eagle Glen meet only every other day, band classes meet every day! In band, it is impossible to participate without the proper equipment. All band students discuss this policy on the first day of band. Learning Target 5, I can practice positive participation in daily rehearsals and concerts, is effected by students not bringing their instrument to class. Participation without an instrument is ineffective. Students are only allowed to store their instruments at school during the school day. When they arrive at school, they will drop off their instrument to the band room and continue to their pod. At the end of the day, student’s will get there instruments and music from the band room Instruments always go home each day and are not allowed to be left at school. Mark you calendar! Beginning Band students have two concerts each year. Concerts are required events. You are welcome to invite friends and family to attend. The first concert usually lasts around 30 minutes. The May concert is the Band Departments showcase called the Band Extravaganza! This concert will feature Eagle Glen, a middle school band, and a high school band. After performing, students watch the other bands perform. It is an opportunity to see what band is like as they get older. Is attendance required at concerts? Yes, attendance at band concerts is required. It's worth pointing out that attendance at band concerts is rarely a problem for students and family members. I think everyone understands how much hard work goes into learning a musical instrument. Plus, it is a lot of fun! Most family members are pleasantly surprised how good the band sounds as an entire group. It is different from hearing only one students practicing at home. Another consideration for concert attendance is that performing is a musical skill that helps build a musicians experience. Concerts are one-time events that cannot be made up when missed. What do students wear to performances? Students will wear the band polo, khaki or black pants, and nice shoes. Information for purchasing a band polo will be made available soon. The same band polo is used for 6th, 7th, and 8th grade bands. This way students can use it for three years. I sometimes get questions like, "will these pants be acceptable?" or "we don't have dress shoes"? I understand you want to do you best. Please use your best judgment and help your child look nice for a very special occasion...their band concert.